This pair of F-5 Clone circuit boards use the same circuit as the Nelson Pass / Firstwatt F-5 model. This is V3.0 of the boards, and it should be assembled using the F5v3 Build Guide. 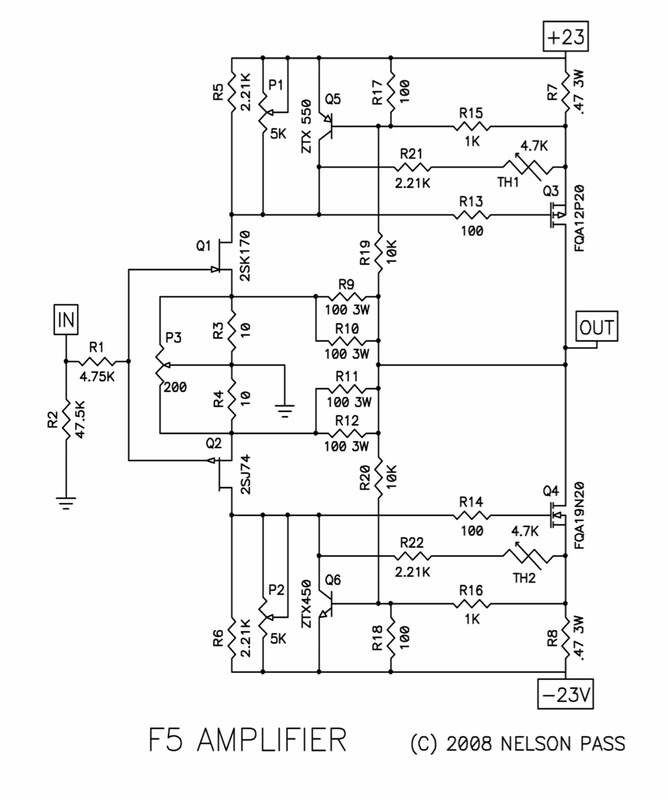 The F5 is a Push-Pull, Class-A power amplifier. It is unique in that it has no capacitors in the amplifier circuit. The F5 is a voltage source amplifier, requiring nothing out of the ordinary from your preamp or speakers. The F5 is probably the most popular amplifier being built on DIYaudio these days. It is simple to make, sounds fantastic, and has similar gain to many commercial amps. Populate these boards with your components, then add your own power supply, chassis and heat sinks to complete the amplifier. The mounting hole spacing is the same as all other diyAudio Version 2 UMS boards. A Bipolar power supply of (+/- 24V) is required. This will require an 18V+18V (or 36V Center Tapped) transformer from 300-500VA, and PSU capacitance of 30,000uF per rail or more. The PSU for the F4, F5, and Aleph J are all essentially identical. See the F5 build guide for details. The 4U Deluxe Amplifier Chassis makes a great home for this amplifier, and has pre-tapped holes that match the circuit board and transistor mounting positions. The diyAudio "Universal Mounting Specification" (UMS) is a common mounting pattern between the amplifier PCB and the heatsinks. If you utilize the UMS on your heatsinks or use one of the pre-drilled chassis from diyAudio, you will be able to quickly and easily mount different amplifier boards in the same chassis. For example, a 4U 'Jack of all Chassis' with a 400VA, 18V+18V transformer and PSU board, will give you a power supply and chassis where you could try the F4, F5, F5C, Aleph J, and other Pass/Firstwatt amps in the future merely by swapping the amp PCB. The investment in Chassis and PSU needs only be made once. Please see the F5 thread in the store support forum for any questions you might have and a definitive list of relevant links and resources. Please note: The F5 V3 boards use the part numbering from the F-5 Turbo article, which is the latest official version of the F5. The P3 is optional and only used for advanced builders with advanced equipment - you can leave it out if you don't have this equipment. Professional service. Product looks good. Fast shipping , excellent quality , thank You very much ! Fantastic quality of PCB as well as amp. I've had no problems whatsoever to put it together and I honestly can say it just sounds sublime. Great quality, short delivery time. Very happy with these PCB's.